The Ile de la Cité is the island in the Seine that is the ancient heart of Paris. Here stand the beautiful Cathedral of Notre Dame and numerous government buildings. If one place on earth means Paris, it is the Ile de la Cité. All road distances in France are calculated from the plaza in front of the Cathedral of Notre Dame. 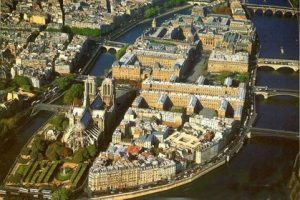 But now Paris City Hall and the national government wish to convert the Ile de la Cité into a theme park for mass tourism. The Ile de la Cité includes the exquisite Ste Chapelle, the Palais de Justice or courthouse, and the Conciergerie, the prison where Marie Antoinette was held. The courts have met there for a thousand years. The sick have been treated in the hospital called the Hotel Dieu since the seventh century. 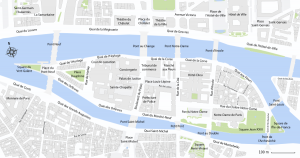 You will find a good history of the Ile de la Cité on Wikipedia. The new plan to make the Ile de la Cité into a sort of theme park, as announced by the office of the star architect Dominique Perrault and the Center of National Monuments, is to empty out most of the urban functions that now make the Ile de la Cité a vital part of the city of Paris, and to turn the former government buildings and hospital into housing, hotels, and to a minor degree office space. The plan is also to build a transparent platform from which tourists will be able to look down into the excavations in front of Notre Dame. A full report in French appears on the blog of SOS Paris. This page is under construction. . . .